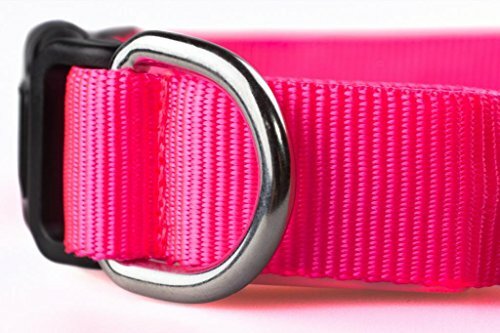 Our flashing dog collar is an easy and attractive way to keep your dog safe on night walks. We've all seen someone out walking a black lab at night. You can only see the dog if light hits his eyes at the right angle. It's dangerous for the dog and potentially heart breaking for the owner. Take the easy step of getting a lighted collar for your dog. You'll be glad you did. 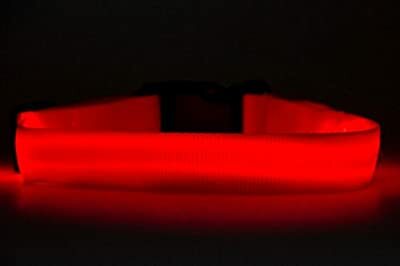 With our well constructed LED dog collar, your dog can be seen at 10,000 feet. This is particularly important if your dog is a dark color or small. Your best friend deserves all that you can do to keep him (or her) safe. Batteries for this collar are standard CR2032 button batteries and an extra set is included so you don't have to worry about dead batteries. A set of batteries lasts 60-80 hours. 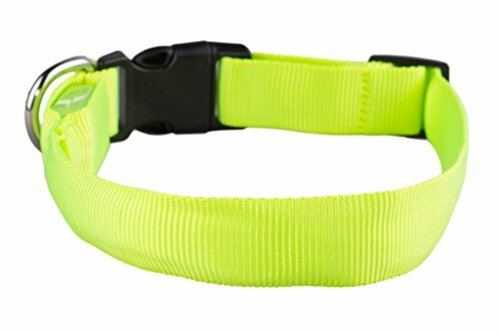 The neon colors of this collar and leash are unusual and fun. The collar comes in 3 sizes and is adjustable using a standard sliding mechanism so that you get a perfect fit for your dog. 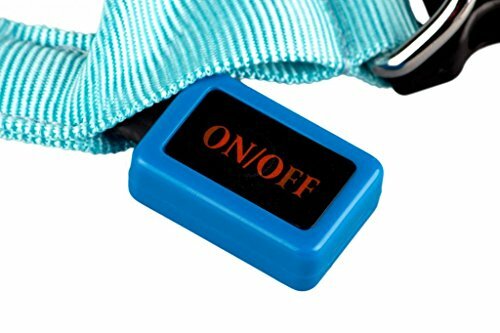 The mode of flashing is controlled by a switch box in the collar or leash. Don't hesitate when it comes to your dog's safety. Pick your size and color and add our collar to your cart now! Your best friend will thank you! Keeping your best friend safe on night walks is essential. Our LED Dog Collar lets your dog be seen at 10,000 feet. It's also pretty eye catching. Flashing Dog Collar manufactured to our high standards. Not a cheap collar that will only last weeks. Made of nylon. Sizes shown below in product description. Batteries last 60-80 hours and an extra set of batteries is included. Collar is water resistent. This means that it's fine in rain but not suitable for a dog who is hunting or swimming. Collar has 4 modes controlled with a switch on the collar - Solid Light, Fast Flash, Slow Flash, and Off.